11146 LOC ESTONIA (1936) Tent*. Scout holding torches*. 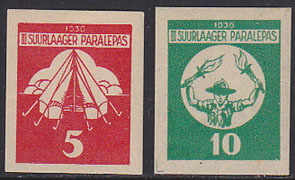 Pair of local stamps for Estonian Scout camp of 1936, denominated "5" and "10". Scarce!